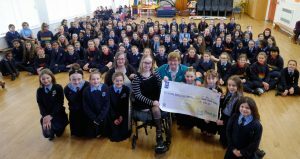 THE girls in Scoil Mhuire gan Smál were absolutely enthralled when they presented a cheque for €700 to a remarkable young woman, Gemma Willis. The youngsters were donating the money to the National Rehabilitation Hospital in Dun Laoghaire, so Gemma picked it up on their behalf. While she was at the school, she took the time to talk to the pupils about her recovery from a horrific car crash in which she lost her leg and damaged her spine. After the accident in October 2015, she spent months undergoing life-saving surgeries in the Mater Hospital, before going on to the National Rehabilitation Hospital, where she learned how to adapt to her new life. Gemma, who hails from Liscolman, Tullow, is the niece of Scoil Mhuire’s secretary Helen Willis. When the pupils set up a student council late last year, they wanted to raise money for a good cause, so they chose the national rehab centre because of Helen’s connection with Gemma. They ran a “crazy sock day”, during which they were all encouraged to do like Pippy Longtocking and wear outrageous socks! Helen also helped them to organise a sponsored word search and between the two events they managed to raise €700 for the rehab centre. The girls presented Gemma with the funds recently and were truly inspired by her story. They were all transfixed as she talked about her life and told them not to be afraid when things went wrong. “She’s a great girl, we’re very proud of her,” Helen proudly told Around Carlow Town. Gemma dedicates her time giving talks to children, teenagers and groups of people on behalf of the rehab centre and is a regular visitor to Dun Laoghaire, where she meets transition year students from local schools. She’s also been chosen as an ambassador for the Mater Foundation’s new fundraising campaign. They need to raise about €140,000 for two life-support machines, so they are using Gemma’s story to illustrate the fantastic work that takes place there. If you’d like to donate to the Mater Foundation’s fundraising campaign, log onto their website for further details.